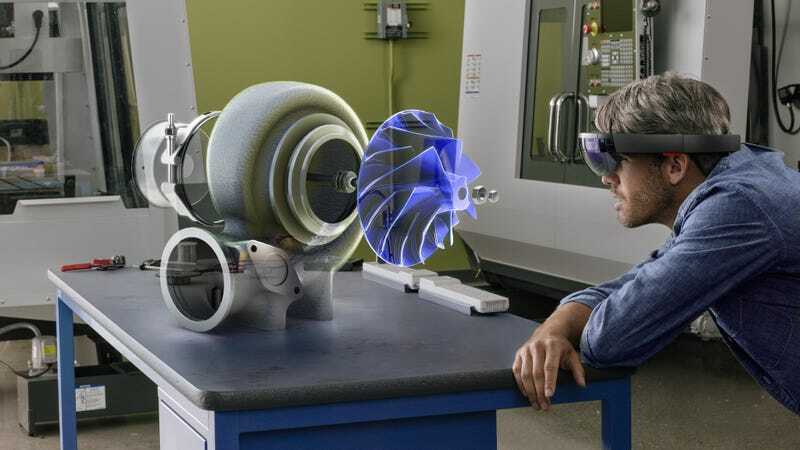 The HoloLens headset from Microsoft is the world’s first untethered wearable that generates holograms before your eyes. It’s been nearly a year since we first strapped on a prototype, and as the tech goliath prepares to unleash a first batch of units to developers in the coming months, I was invited to check out just how far the technology has come. Starting today, Microsoft’s letting developers flock to their flagship store in New York City to try out the same demos I did a few days ago. I should be clear: I tried a version of the headset that’s very similar to what will ultimately ship—for $3000!—but as always, no gadget is final until you’re pulling it out of the box. First, a little bit about how it works. With the HoloLens, the “cursor” is your eyes. You look around a real room you’re in and select holographic images that appear in your goggles by hovering the cursor in the middle of your field of vision over the object. To interact with the object, you “air tap.” In front of the goggles by pointing your index finger in the air and making a fast swipe down motion. Voice commands are also at your disposal. Here at Gizmodo, we’ve had hands on the headset before. And there are still a few pitfalls that still exist: The field-of-vision is still narrow, meaning you can only see holograms directly in front of you. The headset still feels a bit top-heavy, and the adjustment wheel on the strap that goes around the back of your head snags your hair while you rotate it to tighten the thing. But there are many improvements, too. I didn’t see any of the distracting rainbow-like effects at the corner of the goggles, as we did in a previous hands-on opportunity. I also didn’t notice any reflective objects in the room bouncing back light in a way that distracted from the illusion. Actual objects looked like actual objects, and the holograms looked like holograms. I was most excited about getting to play Project X—now called Project X-Ray—for the very first time. This is the dope-as-hell AR video game that Microsoft demoed on stage back in October. Slip HoloLens on, and malicious alien robots tunnel through your breakfast nook’s walls and unload lasers of doom at you. It’s your job to gun ‘em down. It’s Halo meets laser tag. In the game, enemy alien robots explode through the real walls in the room in AR, leaving you to physically scramble around the room to track them down, physically maneuvering to avoid their beams. It’s fun! There were a couple moments when I felt like the image signal flowing before my eyes was kind of weak because the AR images were kind of faint and flickery. The actual gameplay was precise and responsive. Foes disappeared as soon as they were hit, with the same instant feedback you’d find in a traditional video game. Here’s Project-X being demoed for the first time at a Microsoft hardware event back in October. I will say that, out of all three of the HoloLens demos I was treated to, Project X-Ray was by far the glitchiest. Granted, the action was all extremely frantic: Enemies buzzed around me constantly and quickly, which required actual dodging and hopping and pivoting to parry their unending sortie. During all that, it was sometimes hard to keep track of them all because the holograms of my robotic flying foes got weak, started flickering, or were hard to follow in that dinky field of vision. In fairness, the game was just revealed back in October, and it’s the newest of the three demos, so it’s understandable that it’s less polished than the rest. Next up, Microsoft showed me a demo of what it calls “holographic storytelling.” The idea here is that you can replace boring PowerPoints with holograms. (How appropriate for Microsoft!) In the demo, I stepped into a fictional boardroom pitch for a luxury watch. I looked at real table in the room and saw a large hologram watch blown up to the size of a golden retriever. It looked realistic, but the illusion wasn’t totally convincing. For example, the watch was supposed to be directly on the table, but instead the image was canted off-center and appeared to be falling off the edge. From there, I could move the cursor with my eyes to different points of interest on the watch. When I looked at the band, a pop up told me what the links were made of. In another spot I was given info about the battery. The really cool thing about this, from a business presentation standpoint, is that you can actually see where your HoloLens-clad audience is looking at the hologram. You can also transform the hologram so that it looks like a heat map: The redder parts of the “object” are where more people look. In my case, the big watch face was a focal point of the hypothetical audience. For the final demo, I was shown a 3D graphics suite called HoloStudio. Here, you can download a 3D project you’ve already created on a computer, create a hologram out of it, and then tweak it in augmented reality. When you’re tinkering, you can send the project back to your computer or a 3D printer. The first thing you have to do before you turn the real room into an AR workshop for 3D holograms is “scan” the space. This tells the software where you can place your finished creations in the real room. For example, you’ll be able to stick your homemade AR sign on a wall next to a real-life painting, or on an odder shape, like the top of an end table or the side of a sofa. My demo consisted of a cartoony, underwater dive scene inspired by Hawaii. There were small blue fish, a couple of human divers, sand, lots of coral, plants, anemones, and other undersea critters. At first, it was a tiny, diorama hologram—but I could blow it up so that it filled the room until I was inside the underwater scene. I could then use my eye-cursor to select one of the fish, copy and paste him around the vignette. I even blew one of them up to pony-sized proportions. In another scene, I was able to spray paint a Star Wars X-Wing orange. You might be wondering, how’s this any better than virtual reality? It’s a good question! To me, virtual and augmented realities are apples and oranges. While VR is like being cocooned in an 360-degree IMAX planetarium, AR blurs the line between the actual and the virtual worlds. It’s just a different kind of fun to see bloodthirsty extraterrestrials orbiting your buddy’s head in real life, or plowing through the family portrait hanging on your parents’ foyer wall. I’ve truly never played a video game like Project X-Ray before, and so long as Microsoft can make the experience glitch-and-gimmick free, the creative opportunities for developers are limitless. Imagine swinging an AR golf club in your backyard and seeing a holographic ball rocket into your annoying neighbor’s window, or setting off holographic fireworks into a night sky. All in all, I can honestly say that using HoloLens is unlike anything I’ve experienced before. There’s still plenty to be skeptical of: That peskily narrow field of vision needs to be made way bigger to achieve the same level of immersion as VR. This problem hasn’t changed, and needs to be addressed. And the quality of the holograms themselves, as well as the accuracy of their placements in the rooms, were at times unreliable and inconsistent, so that needs work. Plus, HoloLens will only be available to developers and commercial buyers in North America for $3,000 a pop in quarter one of 2016, so it’ll be a while before it’s even available to consumers like you and me. Until then, know that holograms are here, and that some of the biggest tech companies on planet Earth are working to get them in our hands. You should be excited.